The Home Tab is the login landing page for Groovv Register. From here you are able to see a snapshot of daily sales and weekly totals broken down by day and department. Negative amounts are shown in parentheses. This line graph allows you to see a weekly snapshot comparison of today and the previous six (6) days from right to left. Weekly Sales Summary meant to help you decipher what are your strongest volume days of the week. 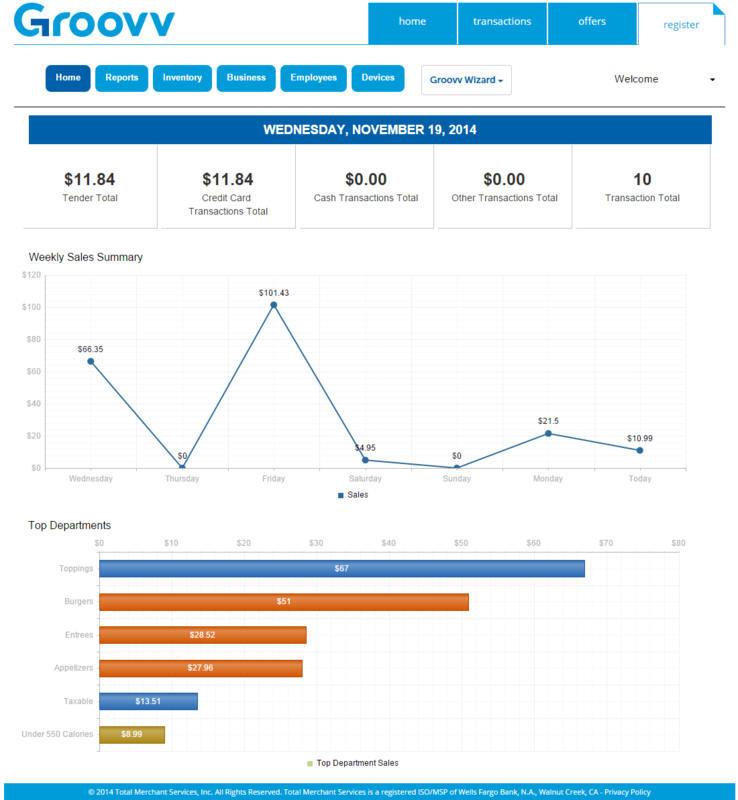 To view customized time range totals visit Sales Reports. This horizontal bar graph shows your top departments by income for the previous week begining from today's date. Top Departments is meant to help you view what departments customers love the most. Only the top six (6) net sales departments are shown in the bar graph. To view all department and item sales visit Inventory Sales Report. * This is a dashboard, not a reporting page. The Home tab can not be edited. To view editable reports visit the Reports tab and select the report type to fit your needs. * The Dashboard does not update instantaneously as sales come in. It can take several minutes for a transaction to become accounted for on the Home tab. Individual receipts can be seen nearly instantaneously from Transaction Detail.